This product should be used to protect workers from electrical shock due to high moisture, mud or standing water in the crawl space. The GFI plugs directly into the main outlet on the home and the main extension cord(s) leading into the crawl space plugs into this GFI. This will protect all extension cords after the GFI. 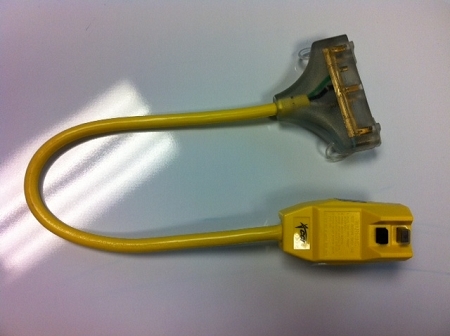 This product has multiple outlets on it to allow up to three extension cords to plug directly into the GFI. This product may not be exactly as show in picture.